Last December I was granted a sack full of money by the Senatskanzlei Berlin for the 2015 digiS programme. 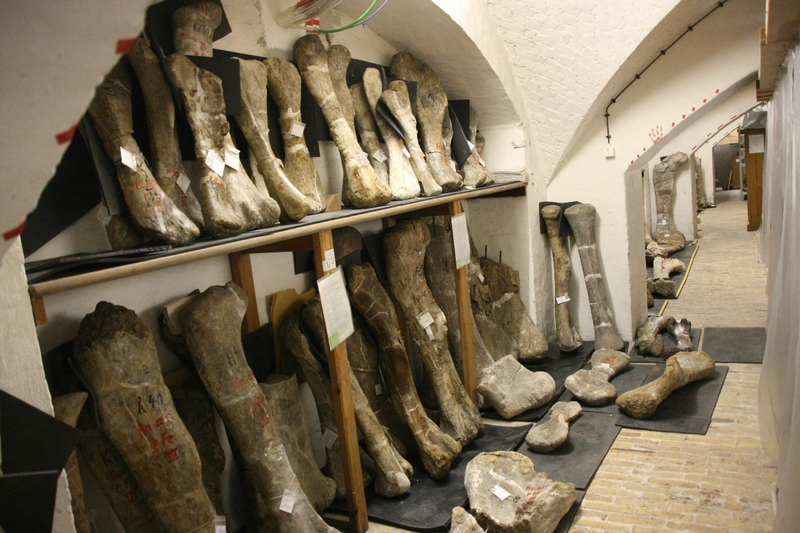 I’ll soon post more about that; what matters for this post is that I promised to mass digitize the rather unwieldy sauropod longbones and girdle bones that reside in the Naturkundemuseum’s Bone Cellar. Overall, there’s ca. 360 such bones, ranging in size from half a meter to nearly 2.5 meters. As a collection they are, therefore, too heavy to transport around. You can lug one or two or even five up the stairs and into a spacious lab, but not hundreds. Therefore, digitizing has to happen in place, in the confines of the stuffed-full Bone Cellar. And that pretty much excludes the vast majority of scanning methods. Room to set up a large and sturdy turntable with a background that doesn’t offer any features? Forget it! Room for a laser scanner? Forget it! Control over lights? Forget it! Time to set up each bone in the middle of a lot of free space? Forget it! Space to wave a held-held scanner around? Maybe, but those that offer a high resolution are quite expensive. Forget it! Time, space and personnel to take the bones elsewhere? Don’t get me started……. What was needed was a protocol that allowed quick, high-resolution digitizing in place. And with “quick” I mean quick. My aim is to spend not more than 6 minutes per bone for the entire process, including set-up and all. The Berlin Bone Cellar has long rows of wooden shelves, and aisles between them that I consider just wide enough to digitize a large bone in them. Therefore, I get help from a preparator to pull out one bone per shelf segment each and put it on a large piece of Styrofoam in the centre of the aisle. Around each bone I place three scale bars. My colleague Matteo Belvedere has created sets of scale bars of various lengths (10 cm to 50 cm) using coded targets, printed on lightweight but stable foam board. Coded target: a picture that Photoscan recognizes and can automatically place a marker in the middle of. Basically, an automatically recognizable bull’s eye. If you have two of them on a piece of material that doesn’t bend, and if you know the exact distance between them, you can use that as a scale bar that the software automatically recognizes the ends of. Saves quite some time when you scale your model. I also prepare a large number of trash bags by cutting their bottoms so they are flat when folded open. I could additionally slit them open lengthwise, but I am too lazy to do that. The last item on the list of auxiliary implements are lots of big, stiff cardboards. Also, I obviously need a camera. With a fairly wide-angle lens – in my case it’s a Canon 70D with a 10-18 mm lens. And, because the lighting is rather suboptimal in the Bone Cellar, a LED ring light. I bought mine cheap: with a set of high-capacity rechargeable batteries it cost me ~70 € only. I could use a proper Canon ring flash, too (Matteo has one, we ran a test and that worked just fine), but the LED ring light works quite well. Now is the time to start photographing each bone. Then, they must be flipped over and photographed again – with a twist: I change the background completely for the second set, so that the photogrammetry software cannot find features on the background that link the two sets. This way, I avoid a lot of cumbersome masking even though the background of each photoset is not featureless. To shoot a photo set, I start by snapping a picture of the specimen tag. Then, I walk around the the first bone, snapping pictures with the camera held low, trying to aim it squarely at the bone at a nearly horizontal angle. Then I do another round, slightly higher up, and finally some overview pics. Or I start with the overview shots and do the near-horizontal round later – doesn’t matter. What counts is making sure I take them all. I end the round with a shot of the ceiling or the tag again, or whatever – simply something that looks very much different from the bone. That makes sorting photos easier, as the different image will stand out the among the Windows explorer previews. Once all bones have been photographed this way, I put the camera aside (making sure to turn off the LED light, to conserve battery), and start flipping over the bones. Now, it is really important to have help with this process, as I also need to alter the background by placing the trash bags all around and under the bone. The stiff cardboards go against the shelves, so that this part of the background is also altered. The scale bars must be removed at this step, otherwise features on them will lead to wrong alignment of photos! It doesn’t matter that the next set of photos will be without scales, because it is enough to have scales on a handful of images. I now take the next set of photos as described above, and for most bones that’s enough. Some, like sauropod tibiae and ulna, tend not to rest stably in two positions roughly 180° apart, but rather in three positions roughly 120° apart. These I need to shoot a third set of. And sometimes I shoot even more sets…..
And then it is time to clear away all the bones and paraphernalia. DONE! May I introduce MB.R.2636, a left Giraffatitan brancai femur? Well, have you understood what I do? Can you do it yourself? Thought so….. it is not easy to image how I do this based on the above description alone. Thus, you can find a video on youtube showing me doing this process for one bone (and Matteo helping). Run time is slightly over 5 minutes, so overall I achieved my 6-minute-aim. I didn’t have the stiff cardboards when I did this, so they are missing. As a consequence, I had to mask the second set of photographs. But other than that the video shows exactly how I do things. This entry was posted in 3D modeling, Digitizing, Dinosauria, Giraffatitan, How to, MfN Berlin, photogrammetry, Sauropoda, Sauropodomorpha. Bookmark the permalink. I’m going to be recording an archaeological archive over autumn/winter so this fast workflow is extremely intriguing. One question on the method – when you say ‘Now I just toss all photos of one bone into one chunk each in Photoscan, and align’ can you clarify? I’m assuming no masking & no markers so you’re aligning the chunks by points – if so then that all makes sense but what happens to the two backgrounds? Are you trimming these in the dense cloud stage as you mentioned elsewhere or does this technique automatically exclude them from the model? as you correctly conclude, this method means that there will be two backgrounds. These I cut out of the dense cloud. Usually, if I did my photo taking right, there will be a narrow gap between the object and the background, making the cutting out easy work. To achieve this, I make sure that the object overhangs the support material a bit, and that I do not take close-up shots of the contact area. Thanks very much for the clarification – looking forward to giving this a try. I am curious what quality the resulting 3D models would have. Do you plan to share part of it, e.g. on sketchfab so that other researchers could have a look? the we are talking accuracies of 0.1 mm error for 25 cm scale bars, and model sized in the 1 to 20 million poly range for “medium” quality. Well, typically I get close enough with my LED ringlight that lighting is not an issue. At worst, you can try to use the in-built flash of your camera. Also, it depends a lot on the ISO value you can maximally use without your camera producing too much noise.